Who is George W. Bush? George Walker Bush was the 43rd President of the United States. The last of the father and son presidents, John Adams and John Quincy Adams were the first, his father was George Herbert Walker Bush, the 41st U.S. President. For being such famous Texans, the Bush family tree is filled with Yankee forebears. Their family tree includes many colonial New England and English ancestors that are shared with thousands of their fellow Americans. More than a few of their ancestors and famous kin are members of the Royal Family. One of the most important events in New England history is the arrival of the Mayflower in 1620 at Plymouth. George W. Bush is a direct descendant through his mother of Mayflower passenger Henry Sampson. He is also a direct descendant through his father of Mayflower passenger Francis Cooke. In addition, George W. Bush can claim a participant of the Boston Tea Party, Samuel Howard, as an ancestor. 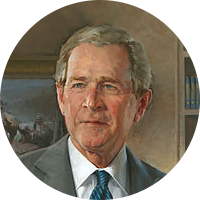 George W. Bush has numerous kinships to other presidents, historical figures, and Hollywood entertainers. One of the more interesting connections is that with both President Barack Obama and Governor Mitt Romney, who fought it out in the 2012 Presidential election.